Austen Henry Layard (March 5, 1817 – July 5, 1894) was a British amateur archaeologist, cuneiformist, art historian, collector, author, and diplomat. He is best known as the excavator of Nimrud, the ancient Assyrian city located on the River Tigris, south of Mosul in what is now Iraq. There he discovered the remains of ancient palaces, sculptures, and inscriptions. He also excavated the nearby mound of Kuyunjik, which he identified as Nineveh, and researched other sites including Babylon. As well as documenting his findings with beautiful illustrations in various publications, which became popular reading, he was able to send many of his findings back to London, where they form a significant part of the collection of Assyrian antiquities in the British Museum. Layard's work greatly increased our knowledge of the ancient civilizations of this part of the world where so many significant events in human history, documented in the Bible and other scriptures, occurred. Austen Henry Layard was born on March 5, 1817 in Paris, France, into a family of Huguenot descent. His father, Henry P.J. Layard, of the Ceylon Civil Service, was the son of Charles Peter Layard, dean of Bristol, and grandson of Daniel Peter Layard, a physician. From his mother Marianne Austen, he inherited Spanish blood. His uncle was Benjamin Austen, a London solicitor and close friend of Benjamin Disraeli. Much of Layard's youth was spent in Italy, England, France, and Switzerland, where he received parts of his education, and acquired a taste for fine art and a love of travel. After spending nearly six years in the office of his uncle Benjamin, he decided to leave England for Ceylon to obtain an appointment in the civil service. He started in 1839, with the intention of making an overland journey across Asia. After wandering for many months, chiefly in Persia, and having abandoned his intention of proceeding to Ceylon, he returned in 1842 to Constantinople, where he made the acquaintance of Sir Stratford Canning, the British ambassador, who employed him in various unofficial diplomatic missions in Turkey. In 1845, encouraged and assisted by Canning, Layard left Constantinople to make explorations among the ruins of Assyria. Layard subsequently explored the ruins of Nimrud on the Tigris River, and the great mound of Kuyunjik, near Mosul (in today's Iraq), already partly excavated by Paul-Émile Botta. In Luristan, Layard encountered the Bakhtiyari tribe for the first time, and spent a few months with them. His book, Early Adventures in Persia, Susiana, and Babylonia (1887) describes his life among the Bakhtiyari. Layard started his excavations at Nimrud in 1845. 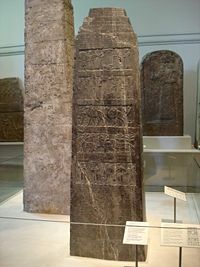 The famous Black Obelisk of Shalmaneser III was discovered in 1846. The monument stands six and a half feet tall and commemorates the king's victorious campaigns of 859-824 B.C.E. Excavations also revealed remarkable bas-reliefs, ivories, and sculptures. 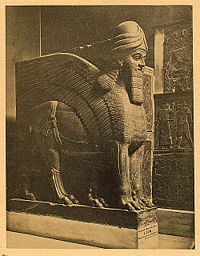 A statue of Ashurnasirpal II was found in an excellent state of preservation, as were colossal winged man-headed lions guarding the palace entrance. The large number of cuneiform inscriptions dealing with king Ashurnasirpal II provide more details about him and his reign than are known for any other ruler of this epoch. In 1847, Layard explored the ruins the mound of Kuyunjik near Mosul, correctly identifying the site as the remains of the ancient Assyrian capital of Nineveh. In the Kuyunjik mound, Layard rediscovered the lost palace, with its 71 rooms and colossal bas-reliefs. He also unearthed the palace and famous library of Ashurbanipal with 22,000 inscribed clay tablets. Layard returned to England in 1848, publishing Nineveh and its Remains: With an Account of a Visit to the Chaldaean Christians of Kurdistan, and the Yezidis, or Devil-worshippers, and an Inquiry into the Painters and Arts of the Ancient Assyrians (2 vols., 1848-1849). To illustrate the antiquities described in this work he published a large folio volume of Illustrations of the Monuments of Nineveh (1849). After spending a few months in England, and receiving the degree of D.C.L. from the University of Oxford, Layard returned to Constantinople as attaché to the British embassy, and in August 1849, started on a second expedition, in which he extended his investigations to the ruins of Babylon and the mounds of southern Mesopotamia. His record of this expedition, Discoveries in the Ruins of Nineveh and Babylon, which was illustrated by another folio volume, called A Second Series of the Monuments of Nineveh, was published in 1853. 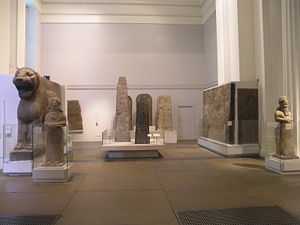 During these expeditions, often in circumstances of great difficulty, Layard dispatched the splendid specimens to England which now form the greater part of the collection of Assyrian antiquities in the British Museum. In early 1850s, Layard turned to politics. His political life was somewhat stormy. His manner was brusque, and his advocacy of the causes which he had at heart, though always perfectly sincere, was vehement to the point sometimes of recklessness. Layard was elected as a Liberal member for Aylesbury, Buckinghamshire in 1852, and worked as under-secretary for foreign affairs. He was in the Crimea (in today's Ukraine) during the Crimean War. In 1855, he was elected lord rector of Aberdeen University, and on June 15, moved a resolution in the House of Commons (defeated by a large majority) declaring that in public appointments merit had been sacrificed to private influence and an adherence to routine. After being defeated at Aylesbury in 1857, he visited India to investigate the causes of the Indian Mutiny against British rule. He unsuccessfully ran for office in York in 1859, but was elected in Southwark in 1860, and from 1861 to 1866 was under-secretary for foreign affairs in the successive administrations of Lord Palmerston and Lord John Russell. Layard became increasingly critical of the British government, especially regarding the handling of the Crimean War and imperialistic policies. This eventually alienated him from politics. In 1866, he was appointed trustee of the British Museum, and in 1868 chief commissioner of works in William Ewart Gladstone's government and a member of the Privy Council. He retired from parliament in 1869, on being sent as envoy extraordinary to Madrid. The same year he was married to Mary Enid Evelyn Guest, a woman with whom he had a relationship with since the 1840s. In 1877, he was appointed ambassador at Constantinople by Lord Beaconsfield. He remained there until Gladstone's return to power in 1880, when he finally retired from public life. In 1878, on the occasion of the Berlin Congress, he received the Grand Cross of the Bath. Layard retired to Venice, Italy where he devoted much of his time to collecting pictures of the Venetian school, and to writing on Italian art. On this subject he was a disciple of his friend Giovanni Morelli, whose views he embodied in his revision of Franz Kugler's Handbook of Painting, Italian Schools (1887). He wrote also an introduction to Constance Jocelyn Foulkes's translation of Morelli's Italian Painters (1892-1893), and edited that part of Murray's Handbook of Rome (1894) which dealt with pictures. In 1887, he published, from notes taken at the time, a record of his first journey to the East, entitled Early Adventures in Persia, Susiana and Babylonia. An abbreviation of this work, which as a book of travel was even more delightful than its predecessors, was published in 1894, shortly after his death, with a brief introductory notice by Lord Aberdare. Layard also occasionally contributed papers to various learned societies, including the Huguenot Society, of which he was first president. Layard died in London, England, on July 5, 1894. Layard’s excavations at Nimrud provided important information on the ancient Assyrian civilization and the culture of Mesopotamia in general. He published numerous works based on his two expeditions, in which he presented in simple layman language the results of his archaeological activities. Through these works, he made this ancient, significant culture closer to Western readers. Layard, A.H. 1849. Illustrations of the Monuments of Nineveh. London: John Murray. Layard, A.H.  1853. The Monuments of Nineveh. London: John Murray. Layard, A.H. 1851. Inscriptions in the cuneiform character from Assyrian monuments. London: Harrison and sons. Layard, A.H. 1853. A Second Series of the Monuments of Nineveh. London: John Murray. Layard, A.H. 1853. Discoveries in the Ruins of Nineveh and Babylon. London: John Murray. Layard, A.H. 1854. The Nineveh Court in the Crystal Palace. London: John Murray. Layard, A.H. 1887. Early Adventures in Persia, Susiana, and Babylonia. London: John Murray. Layard, A.H. 1903. Autobiography and Letters from his childhood until his appointment as H.M. Ambassador at Madrid. (vol. 1-2) London: John Murray. Jerman, B.R. 1960. The Young Disraeli. Princeton, NJ: Princeton University Press. Waterfield, Gordon. 1963. Layard of Nineveh. London: John Murray. A Popular Account of Discoveries at Nineveh – Full-text of Layard’s book (1852). Autobiography and letters from his childhood until his appointment as H.M. Ambassador at Madrid (vol. 2) - Full-text of Layard’s book (1903). Layard’s life and work – Extensive biography with pictures and photos. The Monuments of Nineveh – Layard’s work from 1849. History of "Austen Henry Layard"
This page was last modified on 6 December 2016, at 17:03.